The election of the next Iraq president by the Baghdad parliament has been delayed for 24 hours because Kurd politicians have struggled to put forward a single candidate. As a legacy of the Strategic Agreement between the Kurdistan Democratic Party (KDP) and the Patriotic Union of Kurdistan (PUK), it was agreed that the Kurds’ nominee to succeed Jalal Talabani would come from the PUK. However, the PUK nominated not one but two candidates: Barham Salih and Fuad Ma’sum. 59 Kurdish MPs in the Iraq parliament voted last night and chose Dr Fuad Ma’sum over Dr Barham Salih as the Kurdish candidate. Salih got 23 votes while Ma’sum secured 30, and the remainder abstained. There was wide public support for Barham, a former Kurdistan Regional Government (KRG) prime minister, while Fuad is very unpopular. Fuad is very close to Iran and a friend of Qasim Slemani, who is literarily running the show in the Middle East. The vote against Barham means he is out of the game. It might have been done on purpose by either Gorran or the KDP to further disintegrate the PUK – expecting that he will leave the PUK and join either party. Najmadin Karim was another candidate who vowed not to withdraw his candidacy until Barham Salih withdrew – there seem to be some personal issues between them. Najmadin Karim apparently threatened PUK MPs that, if they voted for Barham, he would still stand and that would divide and weaken the Kurds’ bid to retain the presidency. Karim is the Kirkuk governor, an Iraq MP and a PUK leader. He has been lobbying for the presidential nomination without his party’s approval. Both of em are Irans men in Kurdistan. Dr. Najmadin Karim was a better choice! Aree. You are absolutely right that Dr. Najmadin was the best candidate but he is better for Kurds in Kirkuk and he knew that all along through this process. Barham Salih showed his true colors by abandoning his party in the most critical hour during the recent elections. He should be banished by his party not rewarded. A decision made by a group within the part leadership, a collection of incompetent and incapable “leaders” like Mala Baxtiar, an embarrassment to our intelligence each time we have to hear him speak. He was a head clown in a circus that needed KDP intervention and secret meetings to nominate candidates without consent or even involvement of many politburo members. Shame. 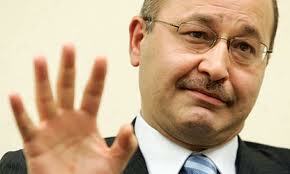 Barham Salih was the best candidate for the kurds. Ma’sum should retire from politics and not risking to repeat the same experience ad Jamal Talibani for president. Ageing does not exclude anybody! It is nonsense that Gorran and PDK will like to see PUK splitted at this point of time. Perhaps later but now, everybody needs a unified kurdish front against Baghdad.